What is Telecommunications Cost Management? Telecommunications cost management is the act of managing and closely monitoring communication costs since the increasing utilization of the internet, mobile devices and corporate networks have also caused the huge increase in the amount needed to deliver these networks. Anyone who decides to be a part of a legitimate telecommunications cost management certification program will learn more about the things that they can do to reduce the amount that they need to spend for all the telecommunication activities of an organization. The act of managing telecommunications cost involves the use of a reliable software which works in storing contract data, conducting auditing functions, interfacing with the systems used for telecom invoicing and reporting all the auditing results. Telecommunications cost management is also an act which uses a variety of ways to minimize telecommunications costs. Among these ways are reducing the usage in the telecom department by making fewer calls and trunks, outsourcing the management of telecommunications, outsourcing the telecom management process, looking for suppliers that offer their services at lower prices, monitoring and immediately correcting errors especially in the billing process, restructuring agreements or contracts with present suppliers, decreasing the amount of tax payments, using a more effective yet less expensive technology, increasing security so losses from toll fraud can be prevented and utilizing more effective internal processes. It should also be noted that a telecommunications cost management certification program does not only require you to learn everything to reduce and control telecommunications costs but also in managing mobility, in improving productivity, in optimizing networks and in allowing your telecom life cycle such as contracts, invoices, inventory, budget management and orders to obtain greater visibility, . If you are one of those who have a strong desire to get their telecommunications cost management certification, then the program related to this field offered by Brainmeasures can work ideally for you. Brainmeasures is an online certification company which has become extremely popular because of its guaranteed legitimacy and its ability to stick to ISO standards. The Brainmeasures telecommunications cost management course is guaranteed to enhance your skills and knowledge in the field since the entire program is created by the renowned and well-experienced experts in the industry. The program comes with a telecommunications cost management exam which serves as an assessment of your skills and knowledge in the field. You can only get your certificate if you prove that you are worthy of it by passing the exam. 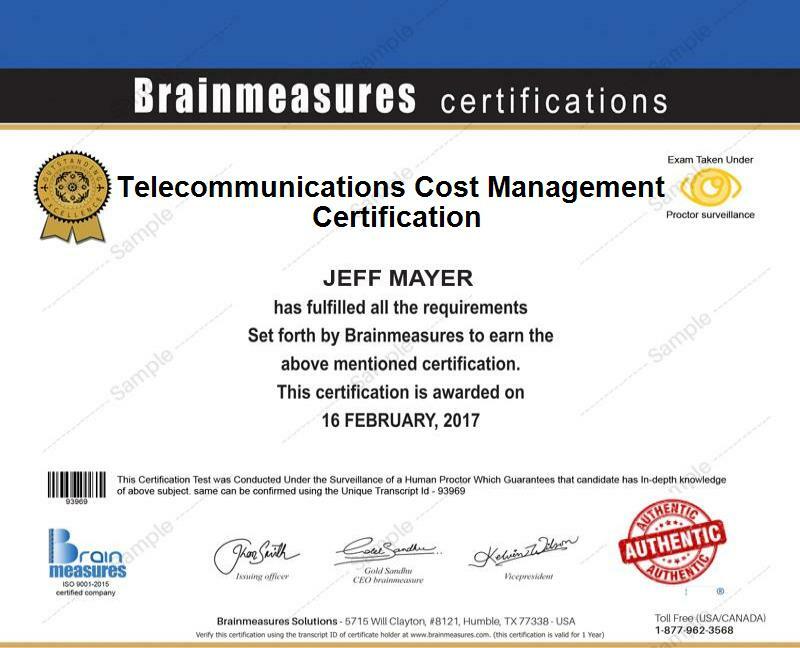 A lot of people can receive benefits from enrolling in the telecommunications cost management certification program offered by Brainmeasures since the need for telecom services is continuously rising. This program is perfect for business owners who focus on providing telecommunication services to the public or for individuals and professionals who are part of the telecommunications department of an organization and are tasked to get the best telecom services while keeping the costs at a minimum. If you want to have a steady flow of income while working in the telecommunications industry, then getting your telecommunications cost management certification is indeed a wise move for you. This career allows you to earn around $68,000 to $112,000 per year.